Hackett, left, most recently served as chairman of Ford Smart Mobility. 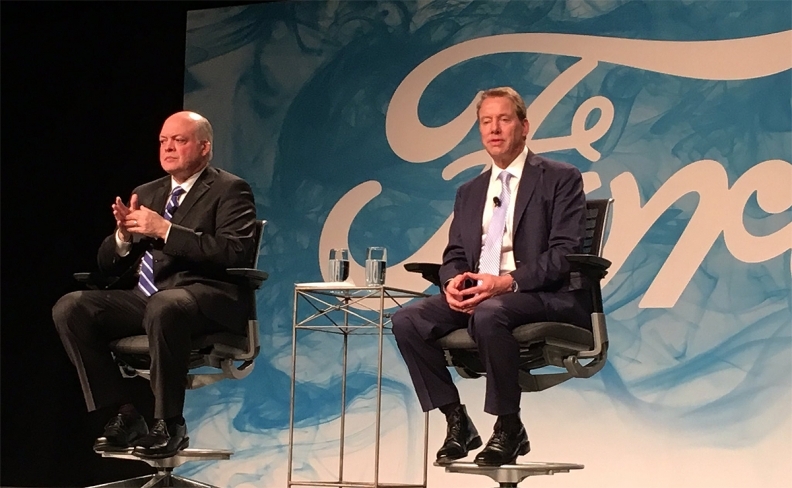 Hackett and Executive Chairman Bill Ford appeared at a press conference Monday. 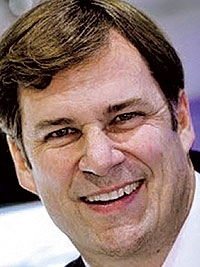 DETROIT -- Ford Motor Co. said CEO Mark Fields is retiring and will be replaced by James Hackett, head of the automaker’s Smart Mobility arm, as part of a broad management shakeup. Ford aims to further strengthen its core automotive business and accelerate a strategic shift to capitalize on emerging opportunities, the automaker said in a statement on Monday. Hackett, 62, former CEO of office furniture maker Steelcase, was on Ford’s board from 2013 until last year, when he took charge of Ford Smart Mobility. Ford created that subsidiary last year to handle its investments in autonomous vehicles and new mobility services. Fields has been pouring billions into self-driving cars and ride-sharing experiments as its traditional car business has struggled in a slowing U.S. market. Jim Farley, president of Ford’s Europe, Middle East and Africa business, is appointed executive vice president and president for global markets. In this role, Farley, 54, will oversee Ford's Americas business unit, along with Europe, Middle East & Africa and Asia Pacific, Ford said. In addition, Farley will oversee Lincoln and global marketing and sales. Joe Hinrichs, head of Ford North America, becomes executive vice president and president of global operations. In this role, Hinrichs, 50, will oversee Ford’s global product development, manufacturing, quality, purchasing among other responsibilities. Marcy Klevorn, 57, vice president of information technology and chief technical officer, will take over Hackett’s role as chairman of Ford Smart Mobility. Fields, 56, had been under pressure for the company’s lagging stock price and lower-than-expected profits so far this year. Board members had recently reportedly questioned Fields’ strategy for the future of the company, which relies on heavy investments in driverless and electric vehicle technology. Since Fields took over as CEO from Alan Mullally in July 2014, Ford’s stock price has fallen nearly 40 percent.